Getting your first stethoscope is a big deal. It, along with the white coat, are the two hallmark symbols of physicians. You will use it on a daily basis for much of third and fourth year, and most likely throughout your career. There are ton of different stethoscopes out there costing anywhere from $5 to $500. It took me hours to find good information about the best stethoscopes for medical students when I was looking to buy one before my second year. This guide will save you a lot of time. 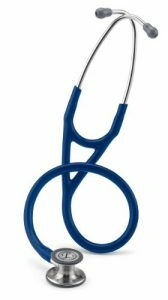 Below are the features that are important to consider when buying a stethoscope; I have also included the 5 best stethoscopes for medical students; you can’t go wrong with any of these 5. The chestpiece is the part of the stethoscope that you place onto the patient to examine him or her. Depending on the stethoscope, the chestpiece can have a diaphragm or both a diaphragm and a bell. The diaphragm is what is usually used, and is best for normal and higher-pitched sounds (e.g., heart sounds, respiratory sounds). The diaphragm can be sized for adults or children, and can also be “tunable” which allows you to hear lower-pitched sounds by adjusting the pressure you’re applying to the patient during auscultation. Tunable diaphragms can be tricky to use, though and aren’t recommended for medical students. Instead, the bell is a more efficient way to listen to lower pitched sounds (e.g., bruits). In general, the best stethoscopes for medical students have both a diaphragm and bell, because it is easiest to use them rather than a tunable diaphragm. The tubing is the rubberized plastic that connects the bell of the stethoscope to the earpieces. This is actually arguably the most important part of the stethoscope as it insulates what you are hearing on exam from the surroundings. If you’re in a busy ER or clinic with lots of ambient noise, a more effective tube is going to make your exam much more efficient. Often, the more expensive stethoscopes will employ a thicker-walled tubing which helps with sound quality. Most will also use a “dual-lumen” which essentially means that the two tubes that connect to the earpieces are insulated by one, larger tube until they connect with the earpieces. The tubing also often comes in different lengths. Generally, something around 27” (a popular size of Littmann stethoscopes) is good. You don’t want to get something too short, which can be a nuisance if you’re taller. In more recent years, companies have released “amplified” or “digital” stethoscopes. These devices modulate the sound, making them louder and easier to hear. They are often many hundreds of dollars, though and unnecessary for most medical students. These can be beneficial for medical students with hearing impairment, though. You can take a look at one of the best models, here. The earpieces are a relatively minor point. You do want something that is comfortable for your ears — most quality stethoscopes will come with several different earpieces that you can swap out to find what works best for you. You can also buy replacements or ones that seal the ear more effectively to further enhance noise-blocking. Most stethoscopes come in a fairly wide variety of colors. They are all equally durable, but lighter colors can be marred by stains and dyes from scrubs. Different colors will vary in price. Grab the color that will make you feel good at a price you’re okay with spending. How much should I spend on my stethoscope? I think the stethoscope is a piece of equipment that you shouldn’t skimp out on. 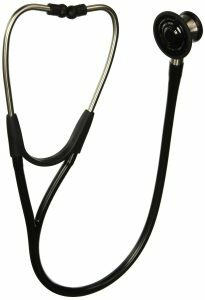 You want a stethoscope that is durable and will offer you the best means for learning. Most likely, you will also be using it for your entire medical career. If you end up going into radiology or pathology you can always sell it later 🙂 I think you can get what you need for around $100-200, which is not much in the grand scheme of a medical education. Where should I buy my stethoscope? I recommend buying it online. A lot of medical schools will have some sort of vendor come to your school to try different gear and let you buy from them. This can be a good time to see gear in person (including stethoscopes) if you want. However, it is not necessary and may overwhelm you into buying things that you don’t need at all. I know some students that ended up buying $300 blood pressure cuffs that they NEVER used. Seriously.. So, I would recommend against buying from vendors because they tend to be more expensive and have inconvenient return policies. I bought all of my stethoscope online as it was less expensive and let me easily exchange/return it if necessary. Amazon is a convenient and well-priced choice. When should I buy my stethoscope? This is likely to be dependent on your particular school. I bought my stethoscope before my second year, as this is when we first began to do physical exams on patients. Feel good buying any of these. They will get the job done, help you learn clinical skills and last you for many years. This is the recent update to the very-popular Littmann Cardiology III. 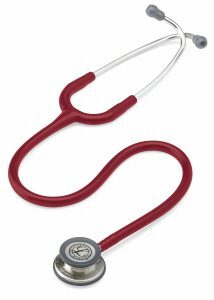 The Littmann Cardiology IV is a great choice for a medical student and other medical professionals. Compared to the Littmann Cardiology III, this model has a longer warranty of 7 years — up from 5 years. This likely isn’t of much consequence as these are very well-built and are often used for over a decade with no problem, but it’s a nice addition. This model also uses an improved tunable diaphragm, which many users have said improves the sound quality compared to the III. It’s also a bonus if you choose to use the diaphragm for low and high-pitched sounds. It has a two-sided bell which allows for both an adult and pediatric diaphragm. That said, you can also convert the pediatric diaphragm into a bell, which is very convenient as most people prefer to use the bell for listening to low-pitched sounds. This model also uses thick rubber tubing and dual-lumen which helps with sound insulation. Both the tubing and the bell are more substantial in this model compared to the Classic III; it is a little heavier but allows for improved sound quality and insulation. It comes in 7 different colors, a 27” and 22” model, and with a couple pairs of earpieces. The older counterpart of the Cardiology IV, the Littmann Cardiology III has been very popular choice amongst medical students. Like the Cardiology IV, it has a two-sided bell which allows for both an adult and pediatric diaphragm. You can also convert the pediatric diaphragm into a bell, which is very convenient as most people prefer to use the bell for listening to low-pitched sounds. This model also uses thick rubber tubing and dual-lumen which helps with sound insulation. Like the Cardiology IV, this stethoscope has thicker tubing and a more substantial bell than the Classic III, which allows for better sound quality. It features a 5-year warranty, you choice of 16 different colors and 6 different metal finishes, 27” and 22” models, and a couple pairs of earpieces. 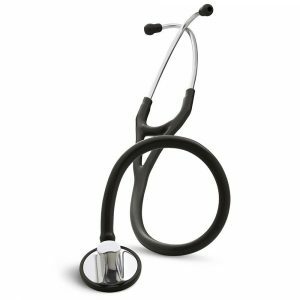 The Welch Allyn Harvey Elite is a very popular stethoscope amongst medical professionals and medical students. It is a similar build to the Littmann Cardiology III and IV but some people feel like it provides a better sound quality or is more comfortable in their ears that the Littmann (of course, these two benefits could be related). This stethoscope comes with a diaphragm and bell (no ability to change the bell to pediatric diaphragm like the Littmann). It has thick rubberized tubing and a dual-lumen for sound insulation. The Harvey Elite has a 10-year warranty (the longest of the bunch) and a limited variety of colors. It comes in 28” and 22” models. 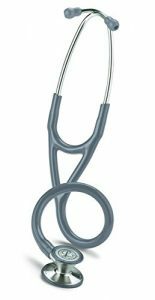 The Littmann Classic III is a more basic stethoscope compared to the other options I have listed. Compared to the Cardiology III and IV, the Classic III has a smaller bell. However, the bell is two-sided with normal and pediatric-sized tunable diaphragms. The pediatric diaphragm can also be made into a bell. This stethoscope also has thinner rubber tubing, and a single-lumen, which provides less sound insulation compared to the Cardiology and Harvey Elite models. Some people I’ve talked to say that it’s harder to pick up on more subtle heart sounds with this model. That said, it will most likely be all you need in medical school if you want to save a little money. The Classic III comes with a 2 year warranty, a couple different earpieces, 27” tubing and your choice of 18 colors and 4 metal finishes. The Littmann Master Cardiology is a step-up from the other Littmann models. It uses a one-sided chest piece that features a tunable diaphragm to hear both high and low-pitched sounds. The chestpiece is designed to give a higher acoustic fidelity when compared to the other Littmann models. If you want the best in this reasonable price range, this and the Harvey Elite are probably the two models to look at. That said, it is likely not necessary for medical students or most doctors as the difference is fairly minute. This model also does not allow for a bell, which as mentioned before, is useful for easily hearing lower-pitched sounds. The Master Cardiology features dual-lumen tubing like the Cardiology III and IV for better sound insulation. The Master Cardiology comes with a 7-year warranty, 7 different colors and 5 different metal finishes. It comes in 27” and 22” sizes.